A Complete Day-By-Day Chronicle Of The Most Epic Event In The 20th Century! Follow The Monumental Steps That Changed History! The chaos, sacrifice and heroism of WWII are presented through a day-by-day profile of the significant milestones that propelled and diminished the most terrifying regime of the 20th Century! 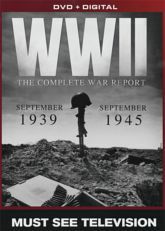 This compelling series highlights the details and daily headlines of September 1939 through September 1945, showcasing the conflicts between the Axis and the Allies. Comprehensive and insightful, these chronicles unravel the epic struggles and unimaginable horror that plagued so many nations. From the front lines to the home front, this exceptional series contains hours of wartime video footage, newsreels, photographs and much more! Each month of the war is individually featured as a 1 hour segment, filled with authentic historic photographs and archival footage.